Making a digital copy of the Blu-ray DVDs for personal use is a good idea to preserve the integrity of the original Blu-ray from scratch without worrying about the various Blu-ray protections. In this sense, you cannot miss WinX Blu-ray Decrypter. The intuitive interface allows you to perform Blu-ray decrypting task in a simple, fast and secure way. In another word, this decrypter can meet everyone’s needs, no matter you’re a tech geek or a green hand. WinX Blu-ray Decrypter is an excellent program designed to decrypt and backup Blu-ray on your hard drive. It’s able to bypass even the latest Blu-ray protections, including AACS MKB v25, BD+. BD-Live, etc. 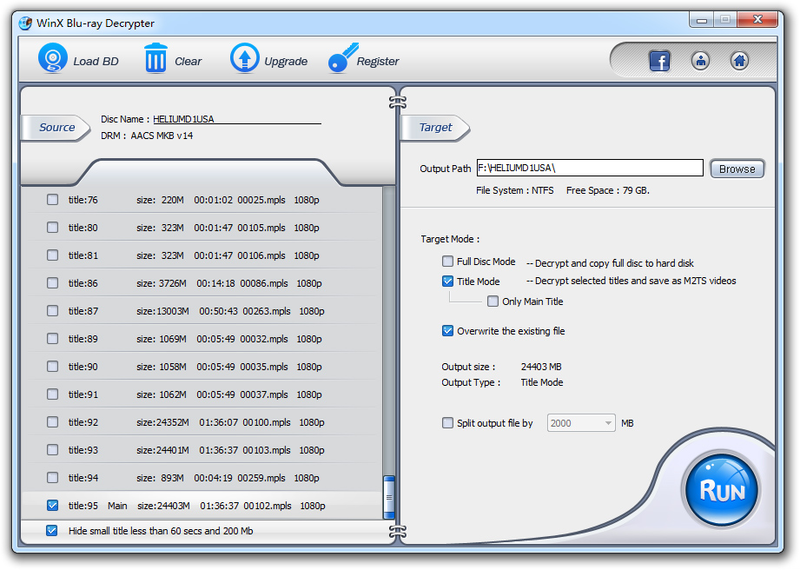 This Blu-ray decrypter supports two different modes to backup Blu-ray: Full Disc Mode and Title Mode. For making an exact copy of the original Blu-ray, you can choose Full Disc Mode. Using the advanced technologies, this Blu-ray decrypter is able to support Blu-ray DTS/E-AC3 and MLP/TrueHD Audio System to keep the original high definition audio/video quality. The output files are fully compatible with a variety of media players, such as DAPlayer, KMPlayer, VLC, MPlayer, Windows Media Player, etc. It’s really convenient for all of Blu-ray lovers. Then you can load your source Blu-ray DVDs by clicking “Load BD” button. The program will analyze the disc automatically and display title info on the left. Next, tick “Full Disc Mode” under Target Mode on the right hand so that the full BD will be decrypted. Finally, click “Run” button at the bottom to start the Blu-ray decrypting process. At the end you’ll get a full digital copy of your Blu-ray. In addition, this Blu-ray solution also supports decrypt 3D Blu-ray to 2D videos in simple clicks.